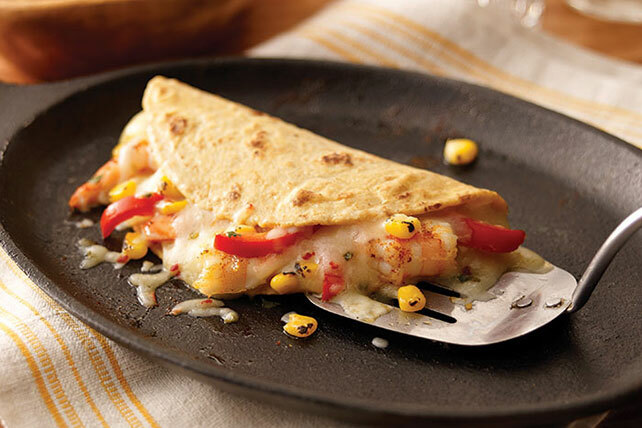 Try these simple and delicious shrimp quesadillas that include the unbeatable flavor combo of cilantro, lime, chili and pepper jack cheese. Heat large skillet sprayed with cooking spray on medium heat. Add corn and peppers; cook and stir 3 to 5 min. or until peppers are crisp-tender. Stir in shrimp mixture; cook 2 min. or until heated through, stirring frequently. Spoon onto tortillas; top with cheese. Fold in half. Wipe out skillet with paper towels; spray with cooking spray. Add quesadillas, in batches; cook 3 to 4 min. or until golden brown on both sides, turning after 2 min. Prepare using blanched fresh corn. Serve with a side of fat-free refried beans and cooked rice.